It's 2005. Apple is working on what will turn out to be the iPhone, but Motorola has beaten Apple to the punch with the ROKR iTunes Phone, a phone so unpleasant that when Steve Jobs demos it on stage, he can barely conceal his contempt. It's 2014. Apple is working on what will turn out to be the iWatch, but Motorola has beaten Apple to the punch with the Moto 360 smartwatch. You can see where I'm going here. This is not the prophesied smart watch you're waiting for. The problem with the future is that nobody's seen it yet, and as a result people's predictions tend to be based on what's already around them. Steve Jobs liked to quote Henry Ford, who said that if you asked people what they wanted they wouldn't have asked to invent the car; they'd have asked for a faster horse. If you look at the various "this is what the iPhone will look like!" mock-ups from before 2007, every single one of them was a faster horse. Look! A Nokia-style slider running OS X! Look! A Motorola Razr running the iPod OS! Look! A BlackBerry running the iPod OS! Look! An iPod Nano with a slide-out keyboard! Look! A Nokia E-series with a click wheel! So far, smartwatches look similar to me. They're either slightly better versions of products that have been around for years, such as Samsung's first Gear, or they're attempts to cram smartphones into tiny screens, such as the newer Android Wear ones. The Moto 360 may be better looking, but it's still just a faster horse. "Yeah, but our one's round!" isn't a killer selling point. Why should anybody buy this? I'm not sure the Moto 360 or Android Wear has the answers to either. Smartwatches aren't completely useless, of course. I can see the benefit of getting a notification from an app, or seeing a text from a VIP, or even - yes! - being able to tell the time without reaching for my phone. But those benefits need to outweigh the downsides: the expense, the looking-like-a-dork factor, the need to charge it, the irritations that come with new product categories. 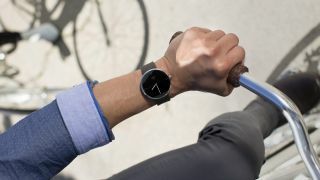 So far I think fitness bands have nailed it and smartwatches haven't, with the honourable exception of the Withings Activité, which is really a fitness band hidden inside a traditional watch. The Moto 360 and other Android Wear devices will get there eventually, I'm sure, but right now they're like the intelligent pan-dimensional beings in The Hitch-Hiker's Guide to The Galaxy: they've got the answer, but they don't really know what the question is. Maybe history won't repeat this time. Maybe the iWatch will be a dog, an overpriced hunk of junk with no obvious purpose beyond parting fools from their money, a hobby rather than a category-defining new product like the iPhone was. Maybe. But if you ask me, the smart thing to do with smartwatches right now is to bide your time and see what Apple's got up its sleeve, however appealing the Moto 360's round face looks right now.